Farthing, 1887. The Great Western is a sleeping giant. The system is plagued by gauge inconsistencies and circuitous routes, and the Churchward revolution is yet to come. 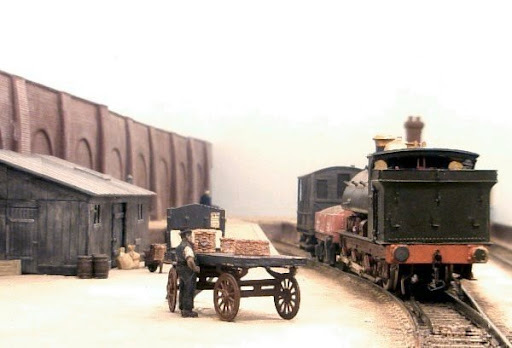 In the bay platform at Farthing, a “Buffalo” sleepily knocks a few wagons about. For the past ten years the world has suffered from a global economic depression, but Workman P. Quince has never read a newspaper and is more concerned with the stinging pain when he urinates. Perhaps he should find a better way to spend his meagre wages. 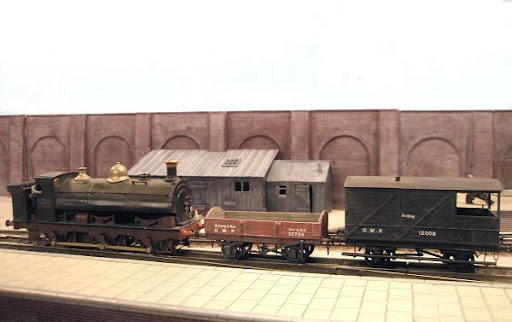 The "Buffalo" shunts the empty Open and brake van into the storage siding.The locos and rolling stock carry the features of a vanishing age. The livery follows Atkins, Beard and Tourret when they state: “Before about 1898, a light red colour had been adopted for the wagon stock with white lettering, but the goods brakes were grey”. A bird’s eye view of the scene. 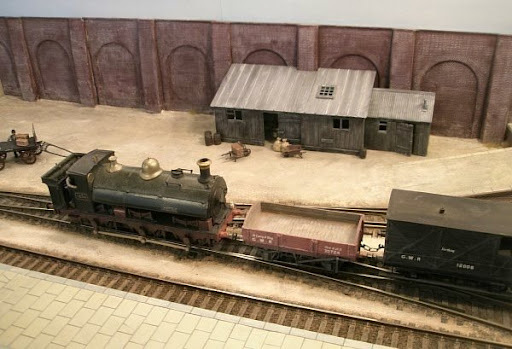 The timber sheds are a bit crude and don’t feature in the normal “1907” set-up of the layout, but I thought they suited the slightly “Wild West” atmosphere of the early days. 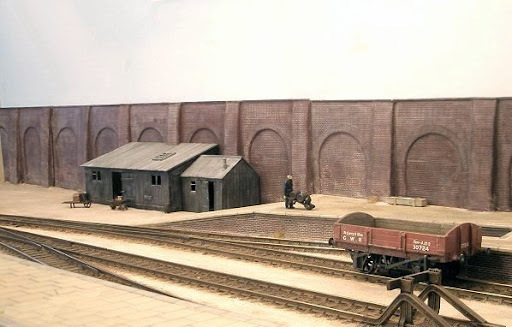 They were loosely inspired by similar sheds at the old Newbury station. As if rebelling against the slumbering nature of his railway, Driver P. Appledore demonstrates his uncanny ability to make even the slowest shunt look like a mainline express. “It’s not what we do” he would tell new firemen, “it’s how we carry ourselves. Look sharp!”. The shunt brings the wagons up against the buffers. 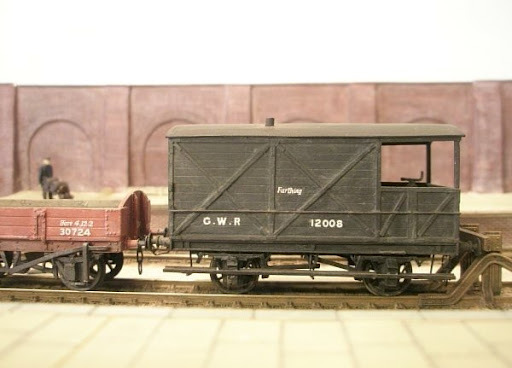 This is a 3-plank Open of 1881 vintage, and a pre-diagram brake van of 1882. The former was built from the David Geen kit, and the latter was restored from an old van originally scratchbuilt by Chris Edge. 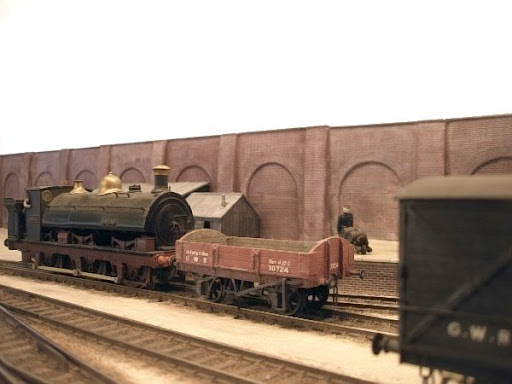 The brake van is left in the storage siding while the Open is propelled to the loading dock. Certain aspects of the loco are not, I fear, entirely correct for the period. Eg I am unsure whether the curve of the cabside is right for 1887. 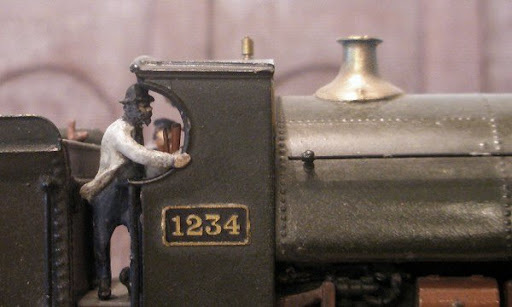 The otherwise appealing number “1234” is also problematic, as I am not sure that this particular loco had yet been converted to narrow gauge by this time. 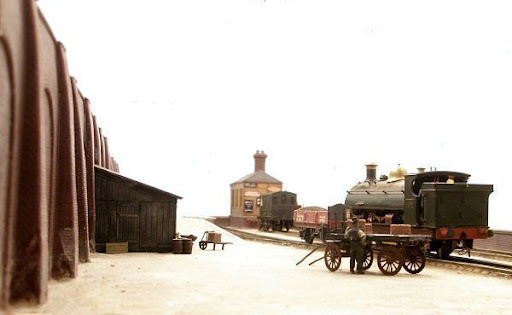 The loco has left and brought the brake van with it. The bay has gone quiet, and Porter C. Walker appears to be lost in thought. Or is he secretely savouring the whisky fumes from the load he carries?